While the transatlantic slave trade lasted nearly four centuries, over one quarter, or 2.9 million enslaved Africans, disembarked in the Americas-and to a lesser extent in Africa- after 1807. About 174,000 of this 2.9 million were “re-captured” by naval vessels, mainly British, charged with suppressing this traffic. These were the “Liberated Africans”. As this population crossed the boundaries of slavery and freedom many times, they reshaped their identities as their faced various systems of race and ethnic classification across imperial boundaries. The locally bounded and trans-nationally-linked meanings of slavery and freedom, as well as race and ethnicity in the nineteenth century will be the focus of this meeting. By gathering scholars experienced on digital research, the first goal of this conference is examining the use of databases, Geographical Information Systems, sound recordings, online storage, and other digital tools to maximize collaborative research, education, and outreach for African Diaspora Studies. 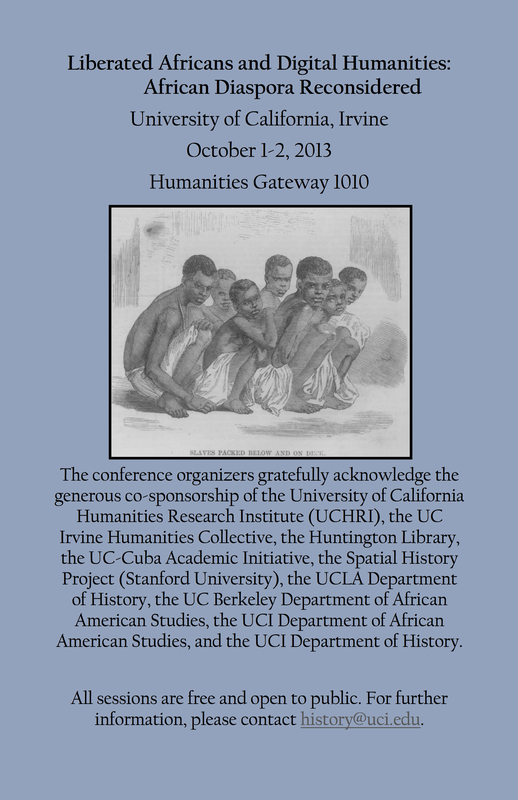 The conference organizers gratefully acknowledge the generous co-sponsorship of the University of California Humanities Research Institute (UCHRI), the UC Irvine Humanities Collective, the Huntington Library, the UC-Cuba Academic Initiative, the Spatial History Project (Stanford University), the UCLA Department of History, the UC Berkeley Department of African American Studies, the UC Irvine Department of African American Studies, and the UC Irvine Department of History. All sessions are free and open to public. For further information, please contact the UCI Department of History at (949) 824-6521 or history@uci.edu. For more: Liberated Africans and Digital Humanities: African Diaspora Reconsidered.